4-star hotel in the centre of Kastleruth, at the foot of Seiser Alm. Modern and elegant rooms, exclusive spa area and much more. NEW since May 2018! Welcome to Hotel Lamm**** alpine lifestyle & spa in Kastelruth! 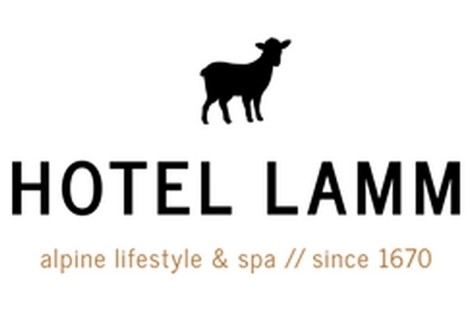 In spring 2018, there will be the re-opening of Hotel Lamm**** in the centre of Kastelruth. The new alpine lifestyle & spa hotel is originally a historical building built in 1670, which has been entirely refurbished and modernised. Our hotel at the foot of Seiser Alm pasture offers views of Dolomites, you will forget never again. In order to offer you the best service, we unite South Tyrolean traditions with elements of casual luxury. Our guests will find elegant and modern rooms with wooden oak floors, spacious and luxurious bathroom, rain shower, separate WC, bio air-conditioning, balcony-loggia or terrace, flat screen satellite TV, Wi-Fi, phone, safe and minibar. One underground parking space per room is included in the price. At your arrival, we welcome you in our large entrance area with reception and multimedia info screen offering useful information for your entire stay. Wellness lovers will look forward to the refined rooftop spa oasis with Finnish sauna, bio sauna, steam bath, adventure showers, relaxation area with waterbeds and sun terrace. 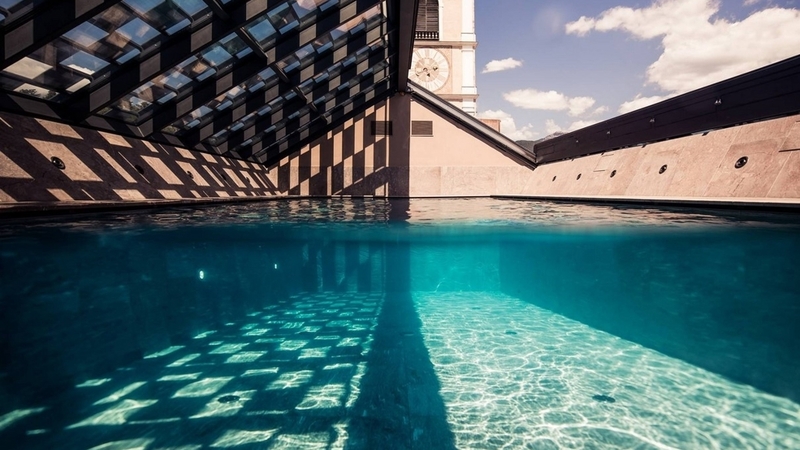 You can look over the roofs of Kastelruth also when bathing in our 30-degree warm rooftop sky pool. Offered as well are a fitness area as soothing massages and beauty treatments. Seiser Alm-Schlern holiday region is the ideal destination for mountain lovers and for all those who love outdoor activities, walks in plain nature as well as breath-taking panoramas. You will get the Mobilcard “Seiser Alm Live” for free at your arrival, allowing you to use all means of public transport in South Tyrol without any cost. ca. 25 m² – for 1-2 persons Cosy room with balcony-loggia. Wooden floor from premium oak, comfortable box-spring-bed, lounge corner with sofa or two chairs, reading table, bio air-conditioning, flat-screen sat-TV, Wi-Fi, telephone, safe and minibar, bathroom with large wellness shower and hairdryer, separate WC with bidet, spa bag with bathrobe and towels for bathroom and sauna as well as one parking space in the underground garage per room. Ideal for individual travelers. ca. 35 m² – for 2-4 persons Inviting double room with balcony-loggia. Wooden floor from premium oak, comfortable box-spring-bed, lounge corner with pull-out sofa or two pull-out chairs, reading table, bio air-conditioning, flat-screen sat-TV, Wi-Fi, telephone, safe and minibar, bathroom with large wellness shower, WC, bidet and hairdryer, spa bag with bathrobe and towels for bathroom and sauna as well as one parking space in the underground garage per room. Ideal for couples or for families with children. ca. 42 m² – for 2-3 persons Spacious double room with balcony-loggia and separate bed bunk with one single bed. Wooden floor from premium oak, comfortable box-spring-bed, lounge corner with cosy chair, bio air-conditioning, flat-screen sat-TV, Wi-Fi, telephone, safe and minibar, bathroom with large wellness shower, WC, bidet and hairdryer, spa bag with bathrobe and towels for bathroom and sauna as well as one parking space in the underground garage per room. Idea for families with one child or for two to three friends. ca. 60 m² – for 2-4 persons Luxurious suite with balcony-loggia, free-standing whirlpool-bath in the room and separate living-/bedroom. Wooden floor from premium oak, extra-large box-spring-bed (210 x 200 cm), lounge corner with pull-out sofa, reading table, bio air-conditioning, flat-screen sat-TV, Wi-Fi, telephone, safe and minibar, bathroom with large wellness shower and hairdryer, separate WC with bidet, spa bag with bathrobe and towels for bathroom and sauna as well as one parking space in the underground garage per room. Ideal for couples. ca. 43 m² – for 2 persons Wonderful suite with roof terrace including whirlpool and view of Sciliar/Schlern mountain as well as spruce wood sauna in the room. Wooden floor from premium oak, extra-large box-spring-bed (210 x 200 cm), lounge corner with cosy chair, reading table, bio air-conditioning, flat-screen sat-TV, Wi-Fi, telephone, safe and minibar, bathroom with large wellness shower and hairdryer, separate WC with bidet, spa bag with bathrobe and towels for bathroom and sauna as well as one parking space in the underground garage per room. Ideal for couples.